Watches are, of course, not a “one size fits all”. I have a mix of watches, all of which cost considerably under $100. I shop shopgoodwill.com and used watches on eBay. In a few minutes, I will be digging out a trench, wearing a battery operated Timex watch that cost me $20 delivered from Goodwill. Tonight, for turkey time, I will wear a used Waltham with a new gold covered band. 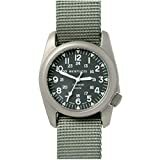 I have some mechanical Victorinox and low end (read Target) solar powered watches for shtf. A good analogy would be to shoes. There are all kinds of shoes with most directed at one purpose to the exclusion of others. One of the reasons I find watch reviews difficult is the fashion element. You can’t evaluate a watch just as a tool; it’s also a piece of jewelry. I know this is an old post, but can you tell me your wrist size? It looks good on your wrist. Measuring around the wristbone, just under 7.5″.